TEMPE, Ariz. – Flow Technology, Inc. (FTI), a leading manufacturer of precision flow measurement instruments, systems and calibrators, today announced the DC-F/IM (Ingredient Measurement) positive displacement (PD) flowmeter system. Featuring a bearingless design with only two moving parts, the DC-F/IM is ideal for measuring high-viscosity fluids in food applications where batch repeatability is desired. Food manufacturers use various flowmeter designs to measure a wide range of thick and/or abrasive liquids, including chocolate, caramel, corn syrup, mayonnaise, frosting, etc. In many of these applications, however, higher viscosity requires that Coriolis meters be specified at a larger line size to minimize pressure drop, which inherently limits the low-end measureable flow rate compared to a smaller line size meter. Employing Flow Technology’s Decathlon Series DC-F PD flowmeter, the DC-F/IM system helps improve quality control in food manufacturing. The DC-F/IM is suitable for measuring flow rates as low as 0.001 Gallons per Minute (GPM) and is designed for applications involving high pressure and pulsating flow streams. Due to its unique geometry, the PD meter can be utilized in the optimal line size, which minimizes pressure drop and enables accurate measurement across the entire desired flow range. 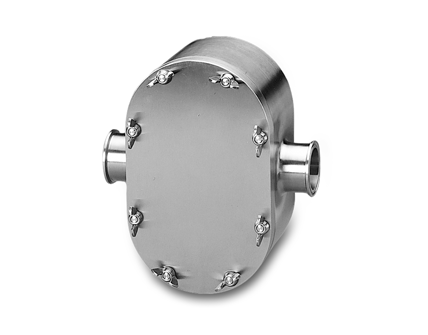 The DC-F sanitary PD flowmeter employs 316 stainless steel construction, advanced thermoplastic impellers, and a non-intrusive pickoff sensor. The meter offers repeatability of ±0.05% of rate and up to 1,000:1 turndown, and can measure viscosities up to 1,000,000 cP+. Unlike some flowmeter technologies, the DC-F/IM system is Clean-in-Place (CIP) compatible—ensuring a low cost-of-ownership. The PD meter can also be quickly opened in-line for inspection and physical maintenance if needed. It is available for 1/8 inch to 2-inch lines sizes. For more information about the DC-F/IM system, please visit https://ftimeters.com.